Polysorbate 80, propylene glycol, sodium acetate, glacial acetic acid, water for injection. Epikavit is indicated as an antidote to anticoagulant drugs of the coumarin type in the treatment of haemorrhage or threatened haemorrhage associated with a low blood level of prothrombin or factor VII. Epikavit ampoules are for I.V. injection. The coumarin anticoagulant should be withdrawn and an intravenous injection of Epikavit given slowly (over at least 30 seconds) at a dose of 5-10 mg together with prothrombin complex concentrate (PCC). Fresh frozen plasma (FFP) may be used if PCC is not available. The patient's INR should be estimated 3 hours later and, if the response has been inadequate, the dose should be repeated. Not more than 40 mg of Epikavit should be given intravenously in 24 hours. Coagulation profiles must be monitored on a daily basis until these have returned to acceptable levels; in severe cases more frequent monitoring is necessary. 1 Fresh frozen plasma (FFP) may be used if PCC is not available. Patients who require emergency surgery that can be delayed for 6-12 hours can be given 5 mg intravenous vitamin K1 to reverse the anticoagulant effect. If surgery cannot be delayed, PCC can be given in addition to intravenous vitamin K1 and the INR checked before surgery. here are limited data regarding reversal of the effects of other anticoagulants, such as acenocoumarol or phenprocoumon. The half lives of these anticoagulants are different to warfarin and different doses of vitamin K1 may be required. Elderly patients tend to be more sensitive to reversal of anticoagulation with Epikavit. The dosage for this patient group should therefore be at the lower end of the ranges recommended. Epikavit Ampoules are for intravenous injection and should be diluted with 55 ml of 5% glucose before slowly infusing the product. The solution should be freshly prepared and protected from light. Epikavit Ampoules solution should not be diluted or mixed with other injectables, but may be injected into the lower part of an infusion apparatus. It is advisable that a haematologist is consulted about appropriate investigation and treatment in any child in whom Epikavit is being considered. 1. Children with disorders that interfere with absorption of vitamin K (chronic diarrhoea, cystic fibrosis, biliary atresia, hepatitis, coeliac disease). 2. Children with poor nutrition who are receiving broad spectrum antibiotics. 4. Patients receiving anticoagulant therapy with warfarin in whom the INR is increased outside the therapeutic range and therefore are at risk of, or are bleeding, and those with an INR in the therapeutic range who are bleeding. For patients on warfarin therapy, therapeutic intervention must take into consideration the reason for the child being on warfarin and whether or not anticoagulant therapy has to be continued (e.g. in a child with mechanical heart valve or repeated thromboembolic complications) as vitamin K administration is likely to interfere with anticoagulation with warfarin for 2-3 weeks. It should be noted that the earliest effect seen with vitamin K treatment is at 4-6 hours and therefore in patients with severe haemorrhage replacement with coagulation factors may be indicated (discuss with haematologist). A dose of 5 mg vitamin K1 I.V. is suggested (together with PCC if appropriate, or FFP if PCC is not available). Intravenous vitamin K1 at doses of 30 micrograms/kg have been reported to be effective in reversing asymptomatic high (> 8) INR in clinically-well children. The patient's INR should be measured 2-6 hours later and if the response has not been adequate, the dose may be repeated. Frequent monitoring of vitamin K dependent clotting factors is essential in these patients. Epikavit is contraindicated in patients with a known hypersensitivity to any of the constituents. At the time of use, the ampoule contents should be clear. Following incorrect storage, the contents may become turbid or present a phase separation. In this case the ampoule must no longer be used. In potentially fatal and severe haemorrhage due to overdosage of coumarin anticoagulants, intravenous injections of Epikavit must be administered slowly and not more than 40 mg should be given during a period of 24 hours. Epikavit therapy should be accompanied by a more immediate effective treatment such as transfusion of whole blood or blood clotting factors. When patients with prosthetic heart valves are given transfusions for the treatment of severe or potentially fatal haemorrhage, fresh frozen plasma should be used. The use of vitamin K1 in patients with mechanical heart valves is generally to be avoided, unless there is major bleeding. Large doses of phytomenadione (not more than 40 mg per day) should be avoided if it is intended to continue with anticoagulant therapy because there is no experience with doses above this maximum of 40 mg per day and higher doses may give rise to unexpected adverse events. Clinical studies have shown a sufficient decrease in the INR with the recommended dosage. If haemorrhage is severe, a transfusion of fresh whole blood may be necessary whilst awaiting the effect of the vitamin K1. Vitamin K1 is not an antidote to heparin. No significant interactions are known other than antagonism of coumarin anticoagulants. There is no specific evidence regarding the safety of phytomenadione in pregnancy but, as with most drugs, Epikavit administration during pregnancy should only occur if the benefits outweigh the risks. There have been reports of anaphylactoid reactions after intravenous injections of phytomenadione. Very rarely, venous irritation or phlebitis has been reported in association with intravenous administration of phytomenadione solution. Injection site reactions have been reported after intramuscular injection of phytomenadione. Hypervitaminosis of vitamin K1 is unknown. 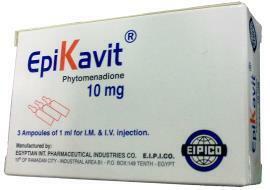 Epikavit is a synthetic preparation of vitamin K. The presence of vitamin K (i.e. vitamin K or substances with vitamin K activity) is essential for the formation within the body of prothrombin, factor VII, factor IX and factor X. Lack of vitamin K leads to an increased tendency to haemorrhage. When an antidote to an anticoagulant is necessary, it is essential to use vitamin K1 itself, as vitamin K analogues are much less effective. In the Epikavit solution, vitamin K1 is solubilised by means of a physiological colloidal system, also found in the human body, consisting of lecithin and bile acid. Owing to the absence of organic solvents, the Epikavit solution is well tolerated on intravenous administration. In blood plasma, 90% of vitamin K1 is bound to lipoproteins. Following an intramuscular dose of 10 mg vitamin K, plasma concentrations of 10-20 mcg/l are produced (normal range 0.4-1.2 mcg/l). Systemic availability following intramuscular administration is about 50% and elimination half-life in plasma is approximately 1.5-3 hours. Store at a temperature 15°C - 25°C, away from light. Don’t use if the solution is turbid. Epikavit Ampoules: Carton box containing 3 ampoules of 1 ml each.